CAPPADOCIA in Anatolia, a region in central Turkey, resembles the surface of the moon. It is dotted with towering anthill-like cones, a network of underground caves and weird rock formations. The cones, known as fairy chimneys, formed after a series of volcanic eruptions millions of years ago. Over the years, wind and water eroded the volcanic rock to form tufa, a soft, malleable stone. Soon, people found that these cones could be converted into eminently suitable dwelling places. In the 3rd century AD, the early Christians who were persecuted by the Romans and later by Muslim invaders, excavated caves in these cones which they used as hiding places. They also built scores of underground chapels and monasteries eight storey’s deep. The caves were inhabited for centuries. Later many were abandoned as the Turks discovered the conveniences of concrete. 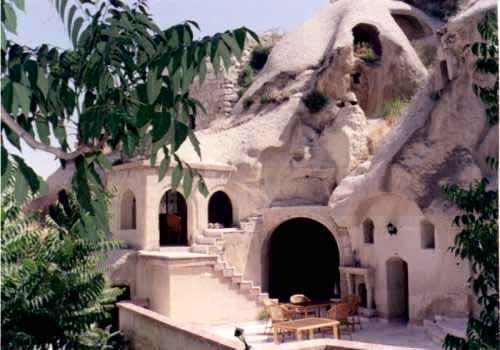 Today, enterprising foreigners and Turkish businessmen have transformed these caves into splendid homes and designer hotels. The rooms have been constructed cleverly without disturbing the original caves, but with luxury fittings including Jacuzzis! This entry was posted on Tuesday, March 25th, 2008 at 7:55 am and is filed under General. You can follow any responses to this entry through the RSS 2.0 feed. You can leave a response, or trackback from your own site.